Cards by Amanda Fluri Designs: Thanksgiving! First of all here in Canada this weekend was thanksgiving. I hope that all of you spent time with family and friends and reflected on the many things that you have to be greatful for. I am reminded again and again how special my fans, and those who support Amanda Fluri Designs are! I just wanted to take time to let you all know that I am truly thankful for you! With that...this card was made for my boyfriends parents. 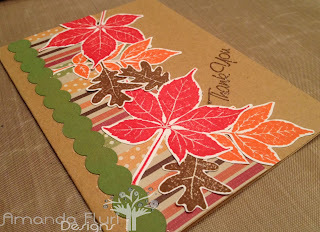 I used my new Hero Arts leaf cling stamps and used Distress Inks to stamp them in. I used a kraft paper base for the card, and pair it up with some lined paper which use fall colours. 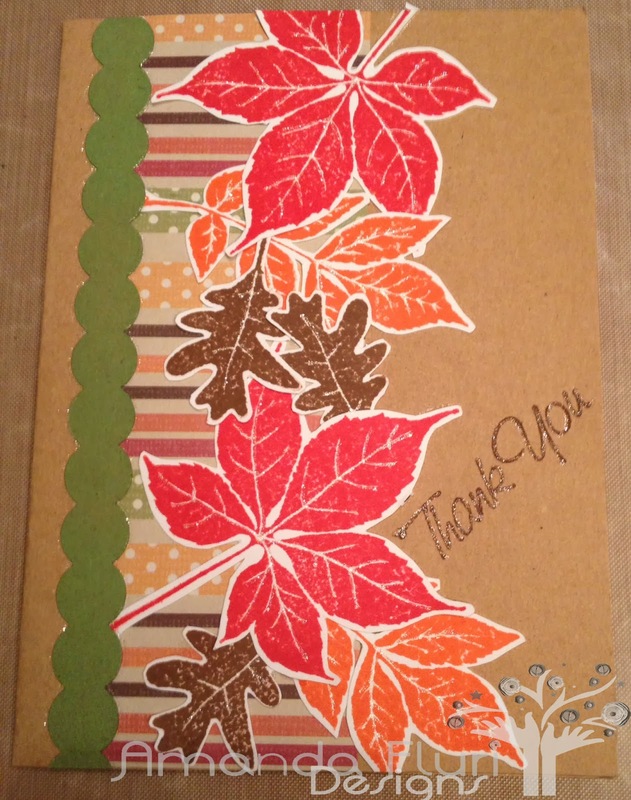 I finished it off with a kraft boarder which I inked up green, and used the words "Thank You". I finished it off by using my stardust pen and adding some glitter to the vanes of the leaves, and the outside of the boarder. This is very different from what I am used to as I tend to lean towards designing using some really vibrant colours...change is good, it was a nice challenge and fun! Love this stamp set, and wish I had gotten it sooner, because I would have loved to have played with it more! I have some other card ideas in mind using these stamps, so you may see a couple more cards with the stamps on them, just depends if time allows. Again THANKS SO MUCH for all of your support!